Surrounded by rolling hills and open space, 31 Drakes Cove Court features sweeping views of the San Francisco Bay to the iconic Mt. Tamalpais with incredible proximity to the lively Marin Country Mart, the Larkspur Ferry Terminal and beautiful hiking / biking trails. With the upmost attention to detail, this high-quality, new construction home features beautiful European Oak floors, 10'-12’+- high ceilings, an open kitchen/family/dining room and phenomenal natural light throughout. 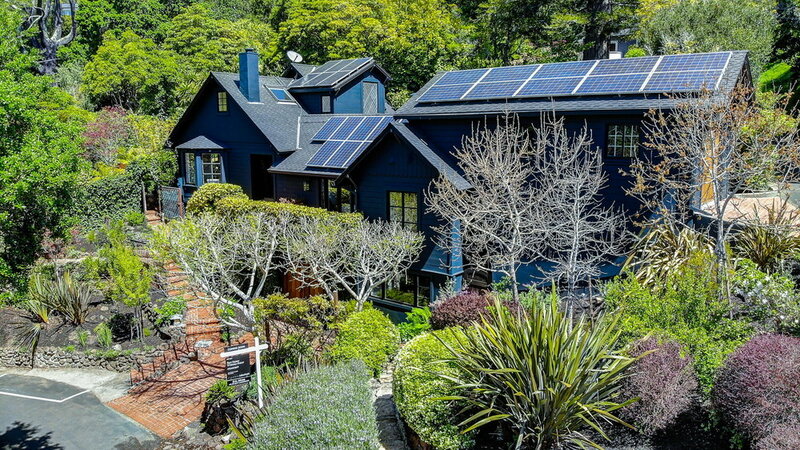 Rarely does an iconic Mill Valley home come to market that has been preserved with such impeccable attention to detail. 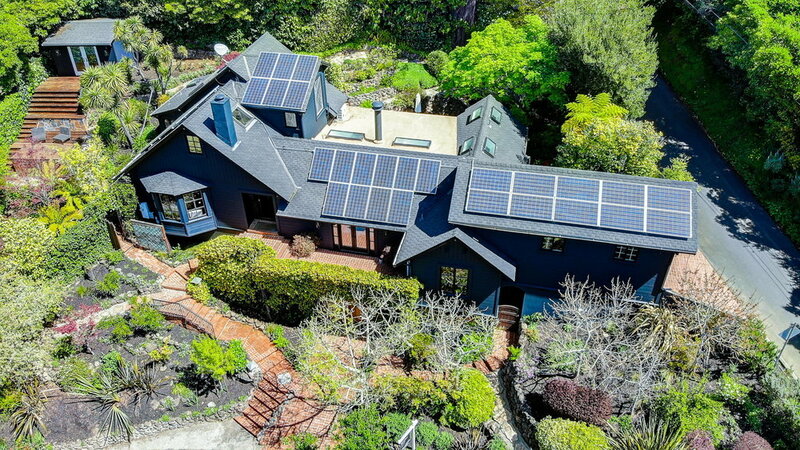 Built in 1940, the 2,600 square-foot 4 bedroom and 3 bathroom home comes complete with iconic Mill Valley views, two expansive living rooms, a formal dining room, detached yoga studio, and is surrounded by lush gardens and outdoor areas that are just as beautiful the indoors on this expansive 8,000 square foot private corner lot. 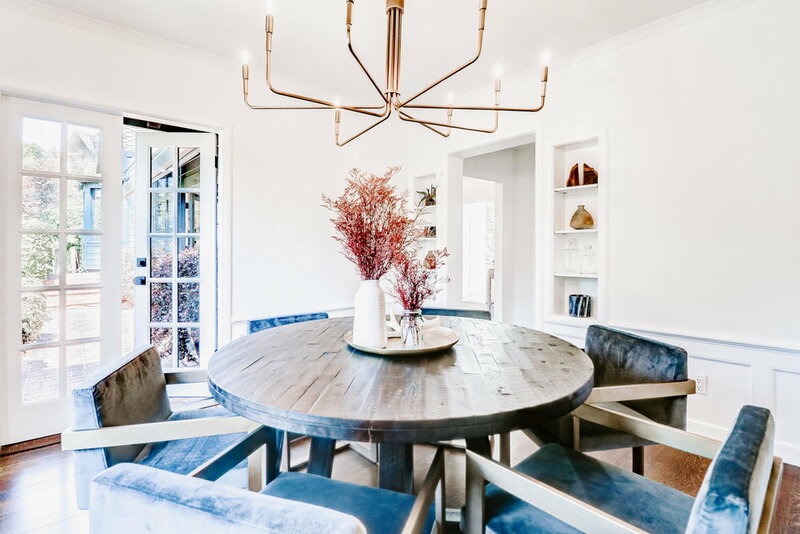 Maintaining the architectural integrity and the historical details of the home was crucial during recent contemporary renovations and the end result is a California contemporary home with a modern yet traditional aesthetic. 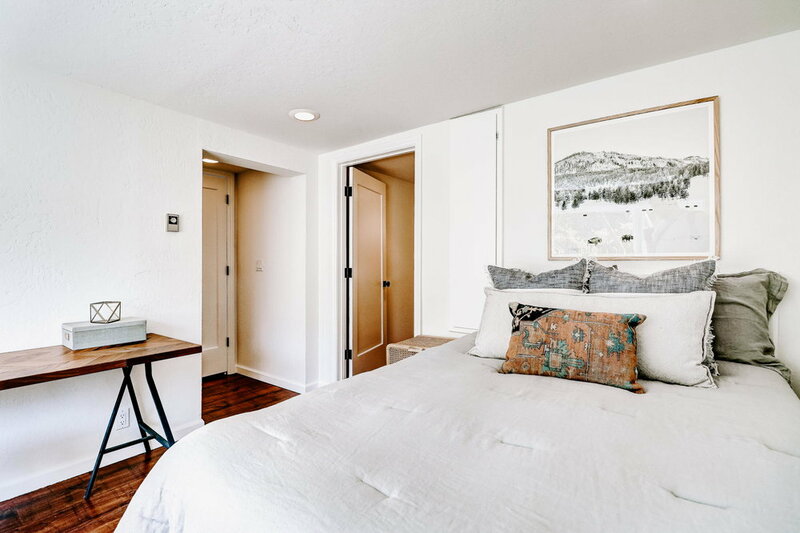 With incredible proximity to Mill Valley’s vibrant downtown shops and restaurants and local access to world-class hiking trails, it’s hard not to fall in love with the lifestyle at 15 Elinor Avenue. 15 Elinor is quite the sight to walk up to. It's a multi-level home fitting of its location amidst gorgeous homes on a tree-lined street in Warner Canyon. 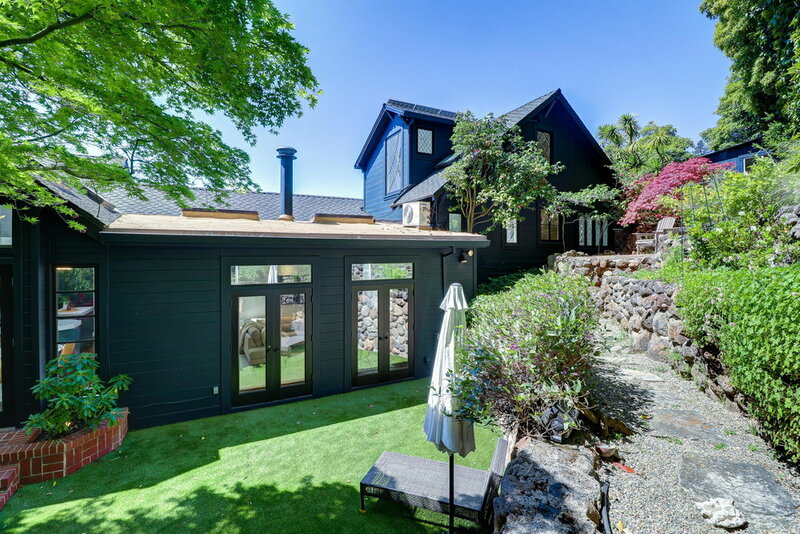 The rich navy charcoal exterior paint reflects the lively color of the greenery that surrounds the property, creating a grand entrance for the home. 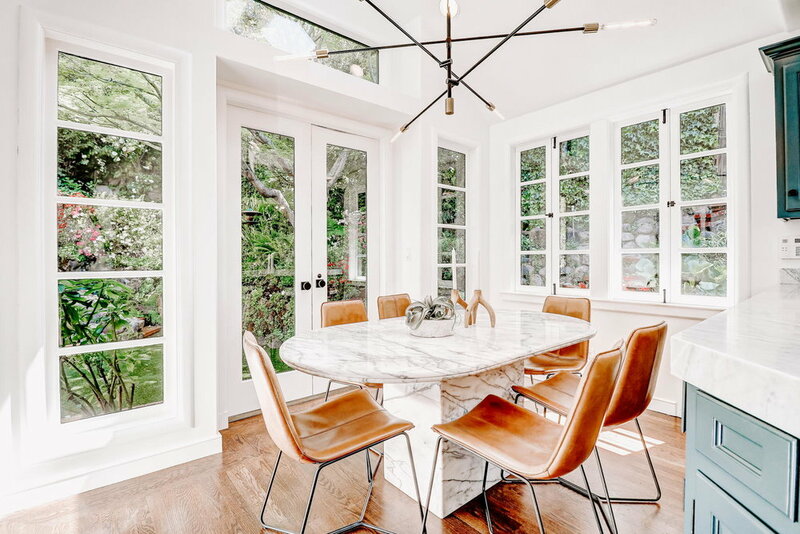 Tall ceilings and french doors that connect to the outdoors make the living rooms feel expansive. 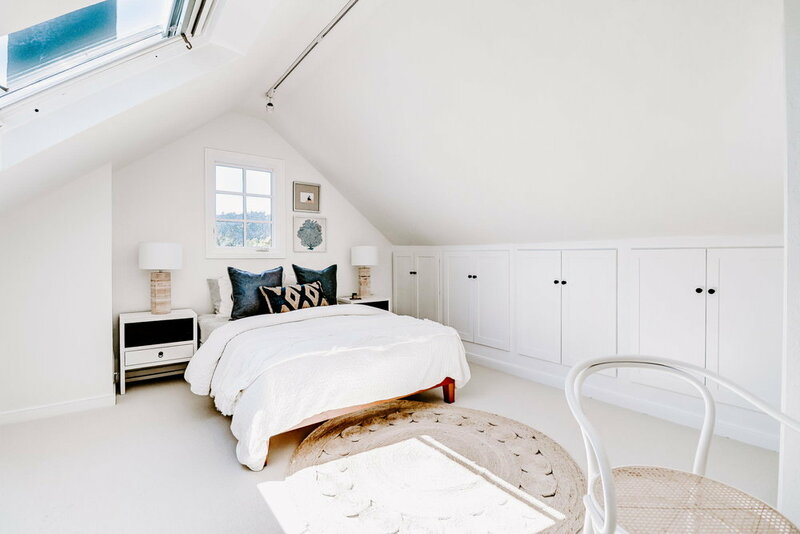 Windows on every level and skylights above invite in plenty of natural light that makes the all-white space feel even brighter. 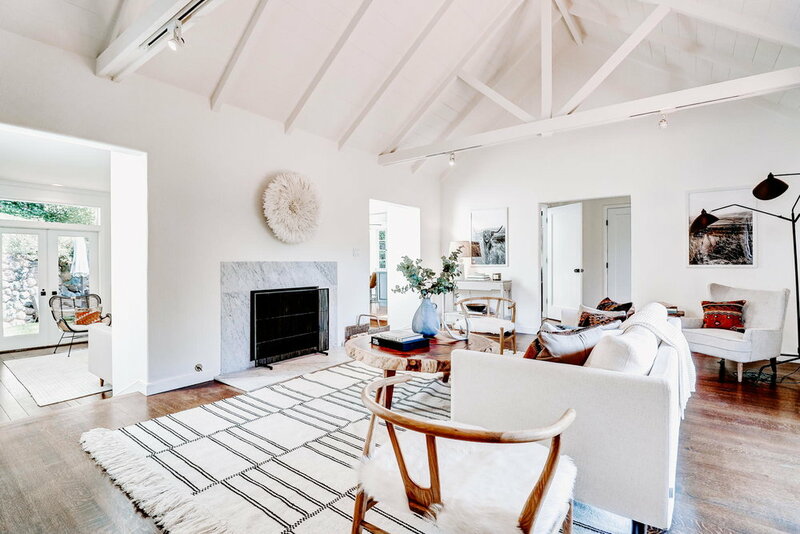 Exposed wood beams, Carrera marble surround fireplace, and original hardwood floors add to the comfortable yet sophisticated atmosphere of the home, as do the warm, modern light fixtures and contemporary hardware throughout. 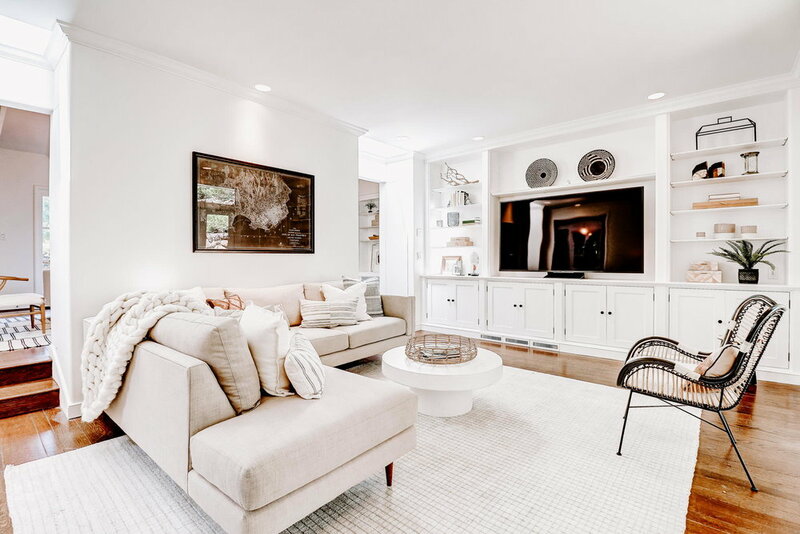 A second, more causal living room with high ceilings and built-in cabinetry connects seamlessly to the large, level lawn through two sets of french doors for effortless indoor/outdoor entertaining. 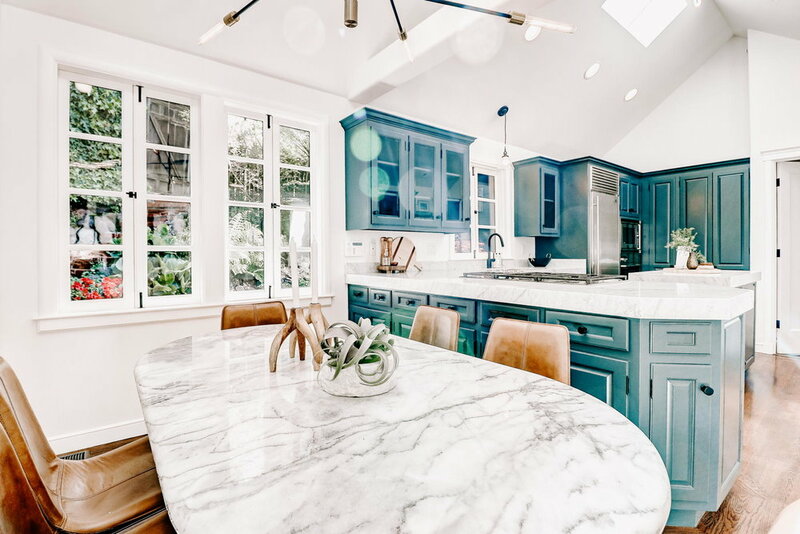 The stunning chef’s kitchen with high, vaulted ceilings and traditional modern mix of classic Carrera countertops with a contemporary color palette and light fixtures makes the space feel cool and fresh for today’s style of living. The most discerning chef will appreciate top-of-the-line appliances, a 6-burner gas cooktop range, functional open-layout, ample storage and bar counter with an additional prep sink and built-in wine refrigerator. An eat-in kitchen surrounded by walls of windows and a set of french doors that connect to the backyard creates an idyllic space for casual weeknight dinners and morning breakfasts alike. 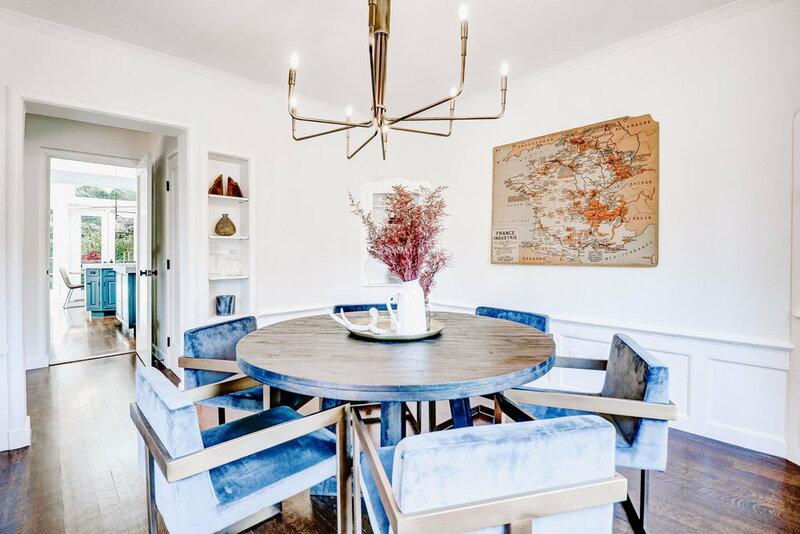 A formal dining room sits adjacent to the kitchen providing a cozy gathering place that seats up to 8 guests. 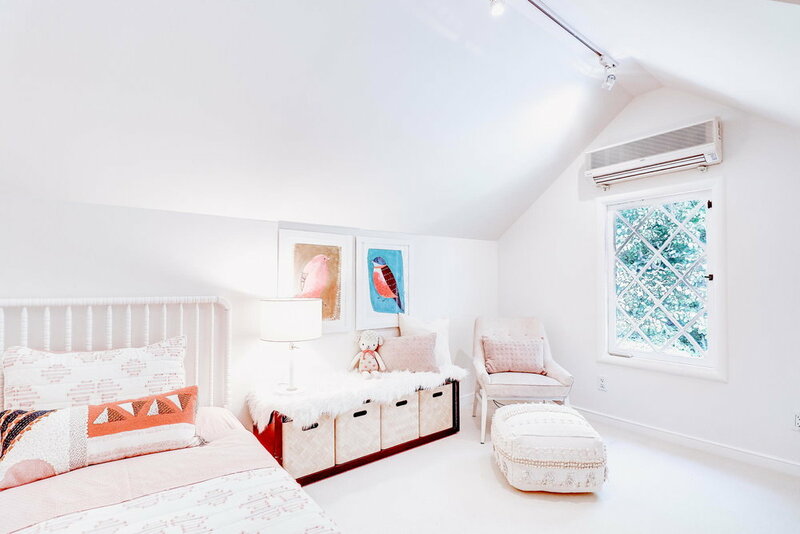 The en-suite master bedroom is just as bright and airy as the rest of the stunning home. 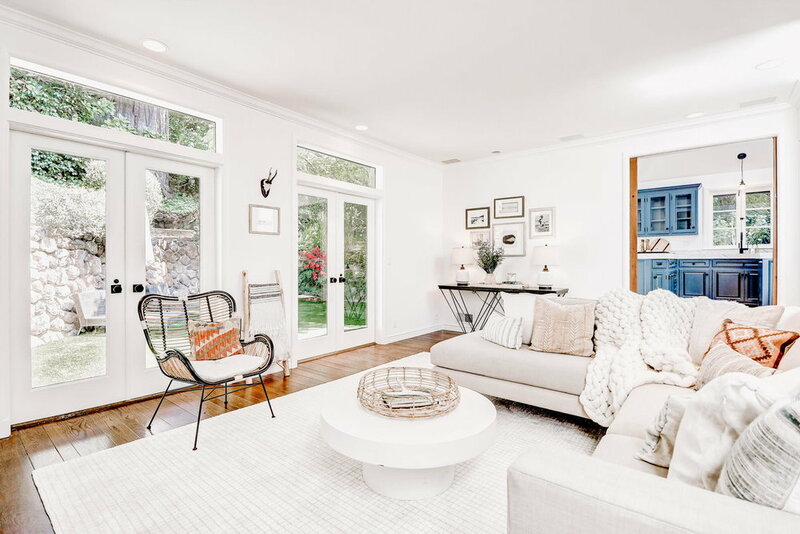 Crisp white walls and hardwood floors contrast beautifully while a big bay window enjoys views of Mill Valley. 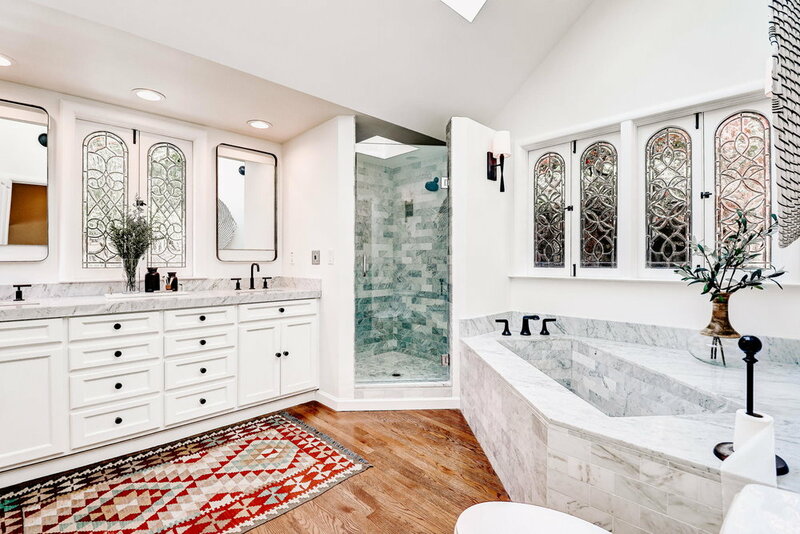 The master bathroom was recently resurfaced to make a statement. 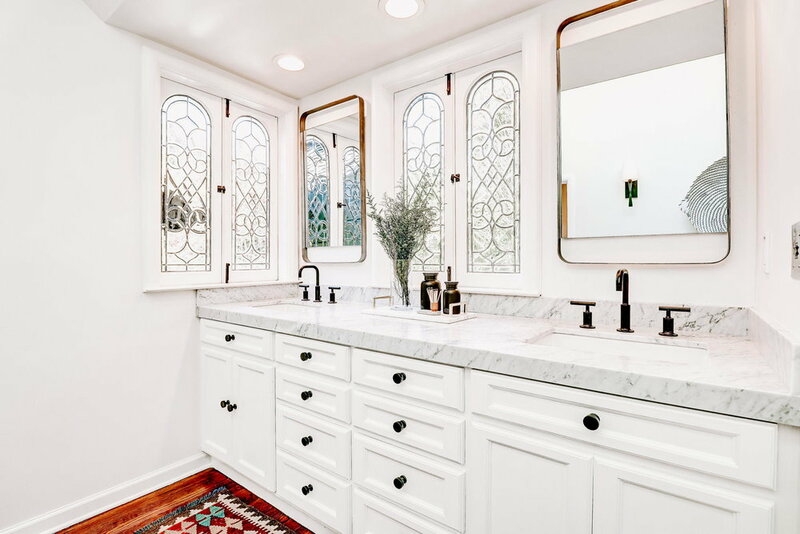 New Carrera marble countertops, bathtub and shower surround combined with black hardware, high ceilings, a large skylight and charming black framed windows create a stunning backdrop for your morning routine. Outside of the master bedroom is a charming stone pathway through the garden to an Ipe wood deck up to the detached yoga studio. The space provides the perfect spot to relax in the fresh air and the view is absolutely incredible - the perfect spot to watch the sunrise first thing in the morning. Although the space offers sweeping views of the surrounding nature, impeccably tailored landscaping offers privacy in what feels like your own Mill Valley retreat. 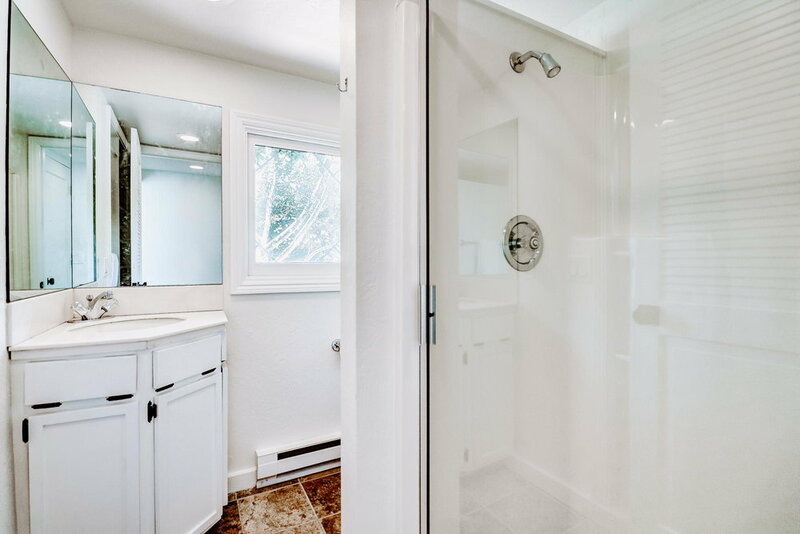 Two additional bedrooms and full bathroom reside on the west wing of the home with high vaulted ceilings and ample natural sunlight throughout. 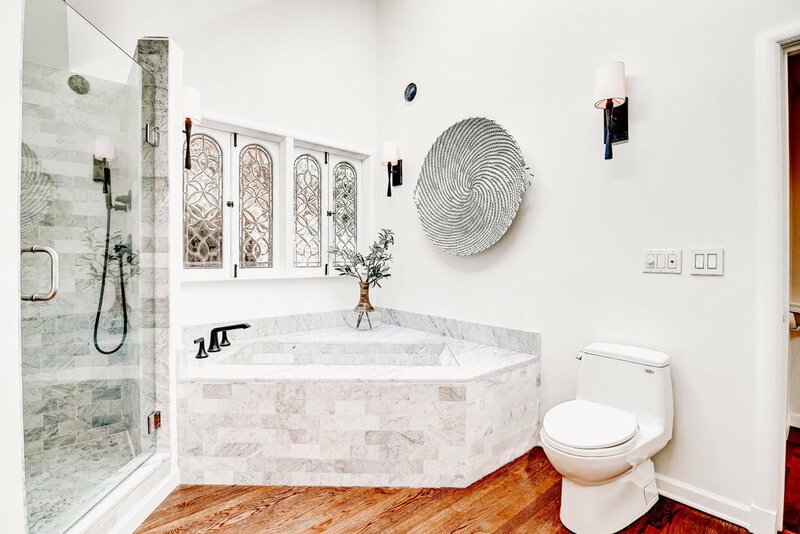 The fourth en-suite bedroom lives on the lower level of the home with its own bathroom next to a large wine cellar and enclosed laundry room. 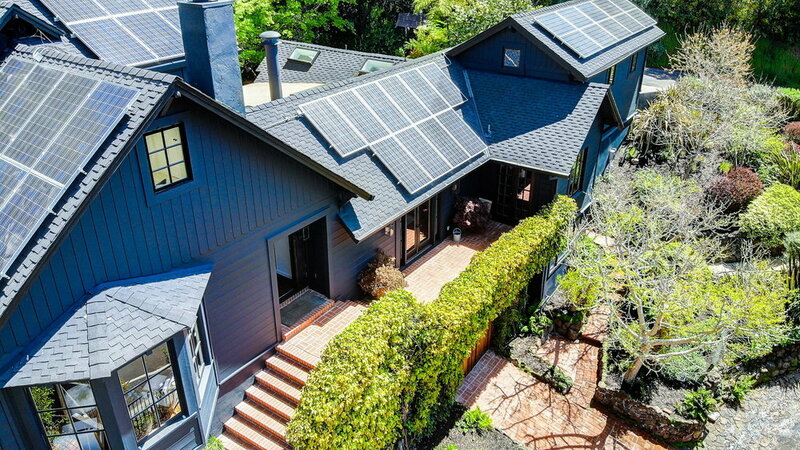 While the property enjoys everything one would expect in a private, serene setting with amazing views, the close-in location allows easy access to everything Mill Valley and Marin have to offer. Resting in a pocket of an amazing micro-climate, you feel like you are worlds away while enjoying easy access to daily destinations. 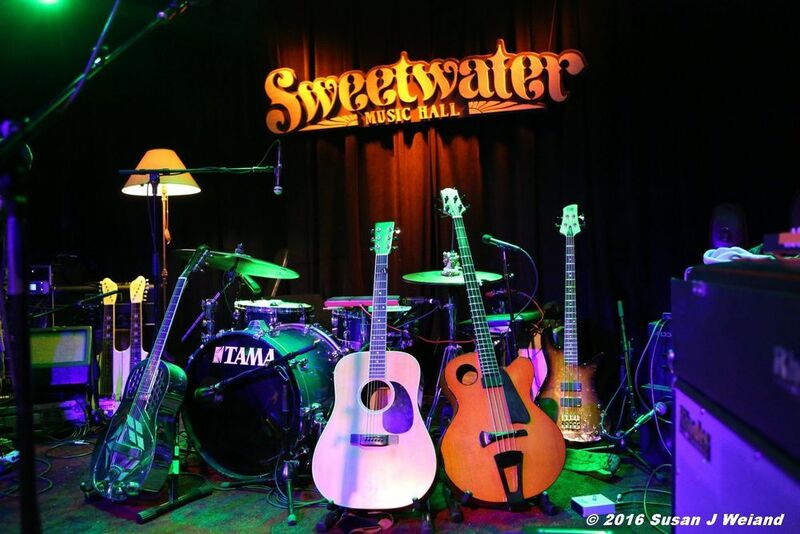 The shops, restaurants and galleries in picturesque Downtown Mill Valley and the world-class hiking trails are easily accessed right out of your front door. 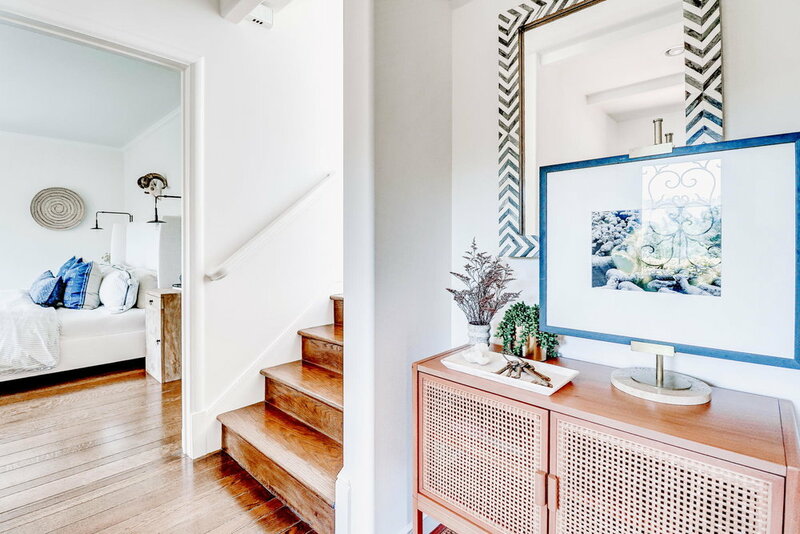 A quick 20-minute drive into San Francisco for work or an evening out is equal distance to Muir Beach and Mount Tamalpais trails making 15 Elinor the ideal home to live the quintessential Marin lifestyle. Families and professionals looking for a laid back, small-town lifestyle, a sun-soaked community and a connection to the outdoors. From downtown Mill Valley it takes 12-15 minutes to get to the Ferry Terminal in Larkspur, 45 minutes to downtown San Francisco, and 55 minutes to San Francisco International Airport. Mill Valley residents have access to award-winning public and private schools from K-12. Elementary students can attend Edna Maguire, Old Mill School, Park School, Strawberry Point, or Tamalpais Valley Elementary. Middle school students attend Mill Valley Middle School and high school students attend Tamalpais High School. In addition to excellent public schools, there are several private campuses in Mill Valley including Marin Horizon, Ring Mountain Day School and Greenwood School. Learn more about the Mill Valley School District here. 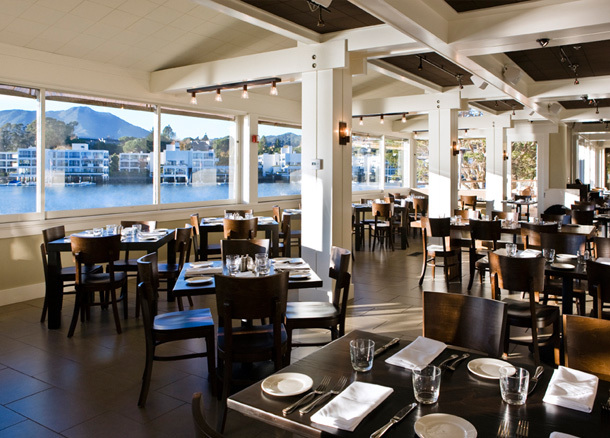 Mill Valley is home to some of our favorite restaurants in Marin County, including The Buckeye, Sol Food, Playa, Balboa Cafe, Piazza D’Angelo, El Paseo, Mill Valley Beerworks, Molina Pizza, Bungalow 44, Samurai Sushi, Prabh Indian Kitchen, Pizza Antica, Urban Remedy, Super Duper Burger, Bookoo and so many more! The Mill Valley community loves bikes. The Mill Valley/Sausalito Multiuse Pathway is a convenient connection between neighborhoods, schools, shopping, restaurants, and both a skate and dog park. Download the Marin bicycle map for the best routes throughout town. 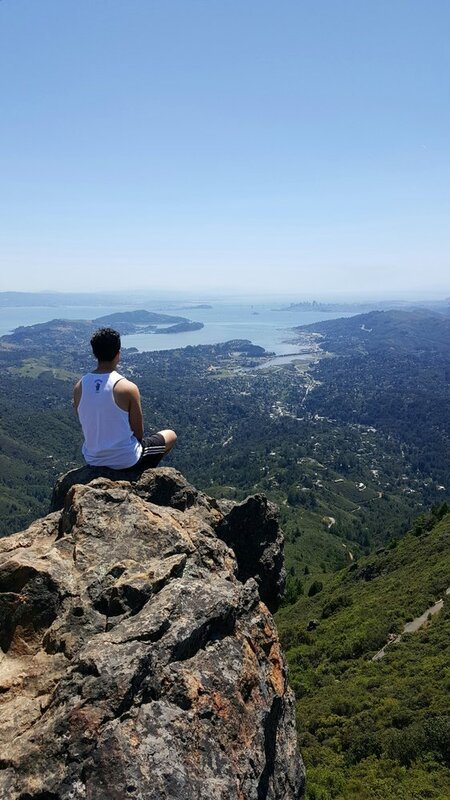 Mill Valley is a famous hiking community with visitors coming from around the globe to trek the trails of Mount Tamalpais. Each neighborhood around Mill Valley offers something unique, from Blithedale Canyon trails through the redwood canopies and popular Railroad Grade to Tam Junction’s quick connection to Tennessee Valley and Muir Beach, it’s hard not to fall in love with every trail in town. Map out your next hike in Mill Valley here. The Mill Valley community is healthy and active. 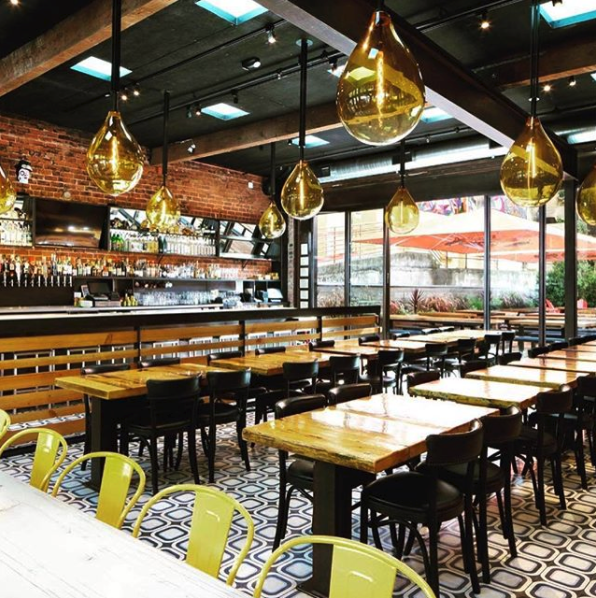 You'll have a variety of fitness centers to choose from including TJ’s CrossFit Gym, The Bar Method, Red Dragon Yoga, YogaWorks Mill Valley, Pilates ProWorks and more. Enjoy one-of-a-kind shopping in Mill Valley’s local boutiques including SummerHouse, The Goods, Proof Lab, Guideboat, The Store, and more. Mill Valleys hosts two Farmers Markets on Friday’s year-round 9:30am - 2:30pm in the Alto Shopping Center at 759 E. Blithedale and on Tuesdays from June to Thanksgiving in the Tamalpais Community Center at 203 Marin Avenue in Tennessee Valley. 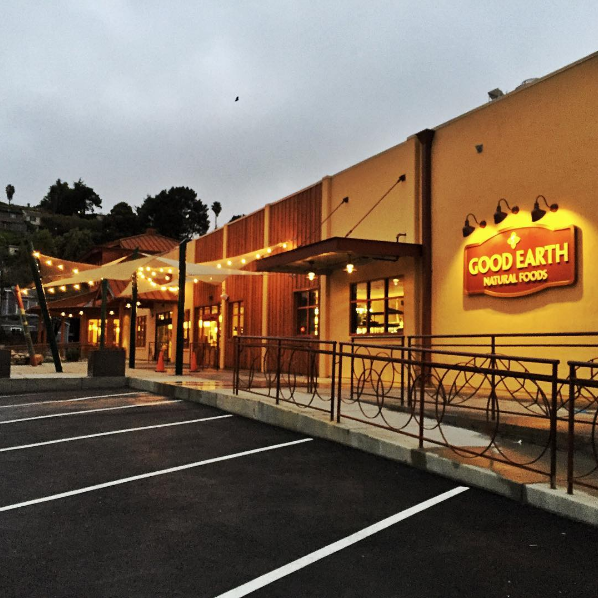 Mill Valley’s go-to grocery stores include two Whole Foods, The Mill Valley Market, Good Earth and two Safeway grocery stores. Downtown Mill Valley is home it’s own boutique movie theater, see what’s currently in theaters here. Mill Valley is a great place to be a dog. From local hikes and beaches to pet friendly restaurants, your four-legged friend is welcome almost everywhere. FUN FACT! 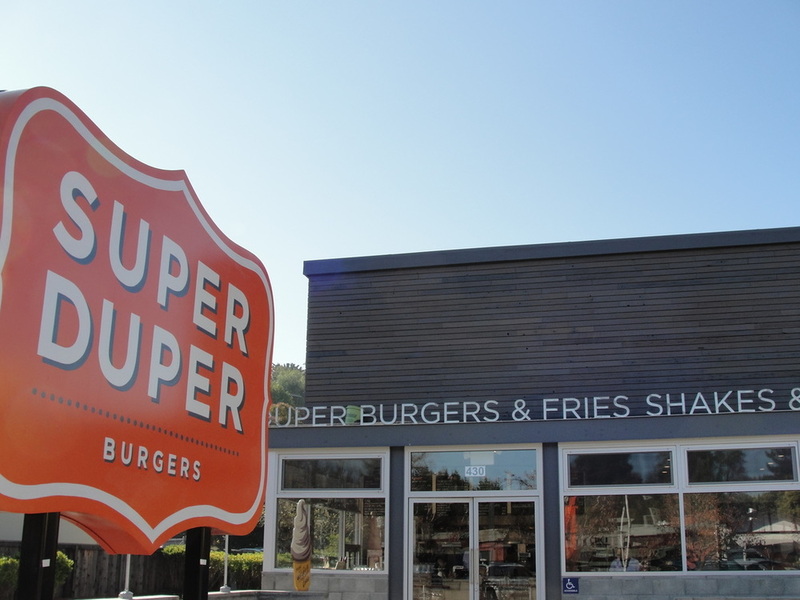 Residents of Mill Valley get a Resident Shopper Vehicle Permit (RSVP) designed to make it convenient for Mill Valley residents to shop, eat and visit downtown Mill Valley without having to feed the meters. Parking everywhere else around town is free and a total breeze.